The IUCN Red List is set upon precise criteria to evaluate the extinction risk of thousands of species and subspecies. These criteria are relevant to all species and all regions of the world. The aim is to convey the urgency of conservation issues to the public and policy makers, as well as help the international community to try to reduce species extinction. According to the International Union for Conservation of Nature (IUCN) (1996), the formally stated goals of the Red List are (1) to provide scientifically based information on the status of species and subspecies at a global level, (2) to draw attention to the magnitude and importance of threatened biodiversity, (3) to influence national and international policy and decision-making, and (4) to provide information to guide actions to conserve biological diversity. Major species assessors include BirdLife International, the Institute of Zoology (the research division of the Zoological Society of London), the World Conservation Monitoring Centre, and many Specialist Groups within the IUCN Species Survival Commission (SSC). Collectively, assessments by these organizations and groups account for nearly half the species on the Red List. As of 2018, 26,197 species are now classified as vulnerable, critical or endangered. The percentage of species in several groups which are listed as critically endangered, endangered, or vulnerable on the 2007 IUCN Red List. The 1964 IUCN Red List of Threatened Plants used the older pre-criteria Red List assessment system. Plants listed may not, therefore, appear in the current Red List. IUCN advise that it is best to check both the online Red List and the 1997 plants Red List publication. The 2006 Red List, released on 4 May 2006 evaluated 40,168 species as a whole, plus an additional 2,160 subspecies, varieties, aquatic stocks, and subpopulations. On 12 September 2007, the World Conservation Union (IUCN) released the 2007 IUCN Red List of Threatened Species. In this release, they have raised their classification of both the western lowland gorilla (Gorilla gorilla gorilla) and the Cross River gorilla (Gorilla gorilla diehli) from endangered to critically endangered, which is the last category before extinct in the wild, due to Ebola virus and poaching, along with other factors. Russ Mittermeier, chief of Swiss-based IUCN's Primate Specialist Group, stated that 16,306 species are endangered with extinction, 188 more than in 2006 (total of 41,415 species on the Red List). The Red List includes the Sumatran orangutan (Pongo abelii) in the Critically Endangered category and the Bornean orangutan (Pongo pygmaeus) in the Endangered category. The 2008 Red List was released on 6 October 2008, at the IUCN World Conservation Congress in Barcelona, and "has confirmed an extinction crisis, with almost one in four [mammals] at risk of disappearing forever". The study shows at least 1,141 of the 5,487 mammals on Earth are known to be threatened with extinction, and 836 are listed as Data Deficient. The Red List of 2012 was released 19 July 2012 at Rio+20 Earth Summit; nearly 2,000 species were added, with 4 species to the extinct list, 2 to the rediscovered list. The IUCN assessed a total of 63,837 species which revealed 19,817 are threatened with extinction. 3,947 were described as "critically endangered" and 5,766 as "endangered," while more than 10,000 species are listed as "vulnerable." At threat are 41% of amphibian species, 33% of reef-building corals, 30% of conifers, 25% of mammals, and 13% of birds. The IUCN Red List has listed 132 species of plants and animals from India as "Critically Endangered." Extinct (EX) – beyond reasonable doubt that the species is no longer extant. Extinct in the wild (EW) – survives only in captivity, cultivation and/or outside native range, as presumed after exhaustive surveys. Critically endangered (CR) – in a particularly and extremely critical state. Endangered (EN) – very high risk of extinction in the wild, meets any of criteria A to E for Endangered. Vulnerable (VU) – meets one of the 5 red list criteria and thus considered to be at high risk of unnatural (human-caused) extinction without further human intervention. Near threatened (NT) – close to being at high risk of extinction in the near future. Least concern (LC) – unlikely to become extinct in the near future. In the IUCN Red List, "threatened" embraces the categories of Critically Endangered, Endangered, and Vulnerable. In the 2001 framework, Near Threatened and Least Concern became their own categories, while Conservation Dependent was removed and its contents merged into Near Threatened. The tag of "possibly extinct" (PE) is used by Birdlife International, the Red List Authority for birds for the IUCN Red List. BirdLife International has recommended PE become an official tag for Critically Endangered species, and this has now been adopted, along with a "Possibly Extinct in the Wild" tag for species with populations surviving in captivity but likely to be extinct in the wild (e.g. Spix's macaw). Comparing the number of species in each category of IUCN Red List. For plants, the 1997 Red List is the most important source. In 1997, the IUCN Red List received criticism on the grounds of secrecy (or at least poor documentation) surrounding the sources of its data. These allegations have led to efforts by the IUCN to improve its documentation and data quality, and to include peer reviews of taxa on the Red List. The list is also open to petitions against its classifications, on the basis of documentation or criteria. A Nature editorial defended the Red List's relevance in October 2008. It has been suggested that the IUCN Red List and similar works are prone to misuse by governments and other groups that draw possibly inappropriate conclusions on the state of the environment or to effect exploitation of natural resources. ^ Watts, Jonathan (5 July 2018). "Red list research finds 26,000 global species under extinction threat". The Guardian. Retrieved 14 February 2019. ^ Matthew Knight (19 June 2012). "Extinction threat 'a call to world leaders' at Rio Earth Summit". edition.cnn.com. Retrieved 13 November 2018. ^ Jessica Phelan (19 June 2012). "IUCN Red List update: Nearly 2,000 species added". www.pri.org. Retrieved 13 November 2018. 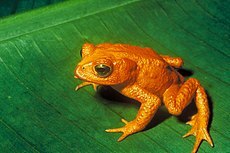 ^ "IUCN 2012 update - 4 species extinct – 2 rediscovered – Food security waning". wildlifeextra.com. 19 June 2012. Archived from the original on 4 March 2016. Retrieved 14 November 2018. ^ a b James Ayre (20 June 2012). "The Red List Of Threatened Species, Annual Report Released". planetsave.com. Retrieved 13 November 2018. ^ K.S. Sudhi (21 June 2012). "Red list has 132 species of plants, animals from India". thehindu.com. Retrieved 13 November 2018. ^ "IUCN RED LIST CATEGORIES AND CRITERIA Version 3.1 Second edition" (PDF). 2012 International Union for Conservation of Nature and Natural Resources. 2012. ^ S. H. M. Butchart; et al. "Going or gone: defining 'Possibly Extinct' species to give a truer picture of recent extinctions" (pdf). Bull. B.O.C. 2006 126A. ^ "Birds on the IUCN Red List". BirdLife International. Retrieved 26 January 2007. ^ "Which IUCN list should I choose?". Botanic Gardens Conservation International. ^ N. Mrosovsky (1997). "IUCN's credibility critically endangered". Nature. 389 (6650): 436. Bibcode:1997Natur.389..436M. doi:10.1038/38873. ^ "The Red List still matters". Nature. 455 (7214): 707–708. 9 October 2008. Bibcode:2008Natur.455R.707.. doi:10.1038/455707b. PMID 18843306. ^ Hugh P. Possingham; et al. (November 2002). "Limits to the use of threatened species lists". Trends in Ecology & Evolution. 17 (11): 503–507. CiteSeerX 10.1.1.467.6031. doi:10.1016/S0169-5347(02)02614-9. Walter, Kerry S.; Gillett, Harriet J., eds. (1998). 1997 IUCN red list of threatened plants. Gland, Switzerland: International Union for Conservation of Nature and Natural Resources Species Survival Commission. ISBN 9782831703282. Wikimedia Commons has media related to Species by IUCN Red List category. This page was last edited on 19 April 2019, at 15:28 (UTC).